… The Defense Department has never before acknowledged the existence of the program, which it says it shut down in 2012. But its backers say that, while the Pentagon ended funding for the effort at that time, the program remains in existence. For the past five years, they say, officials with the program have continued to investigate episodes brought to them by service members, while also carrying out their other Defense Department duties. I both agree and disagree with the last, bolded statement. I disagree that this is evidence of aliens existing; to me, the bar for accepting the existence of extra-terrestrial life is much higher than simply seeing things in the sky that are of unknown origin, which leads me to question leading into my second point. Why is it that so many people are all-too-willing to, on the basis of incomplete or scant evidence, draw the conclusion that such things are, by default, extra-terrestrial visitors from another planet? To explore the flaws in such thinking, we must first revisit the definition of the term “UFO”. A UFO is, by definition, an unidentified flying object. This means that, quite simply, we do not know what it is – it doesn’t mean that it’s a bird, weather balloon, alien spacecraft, or even Santa Claus (but I highly doubt it is Santa Claus, for reasons outlined here). It means that we lack enough information to state that we know what it is. But this area of uncertainty is where the alien spacecraft advocates insert their questionable logic. Usually, the argument goes something like this: “Well, it couldn’t be anything else but an alien ship!” Right? Wrong. To claim that a UFO is an alien spacecraft is to identify it, which is a direct contradiction; you cannot claim that something is both unidentified yet identified simultaneously. 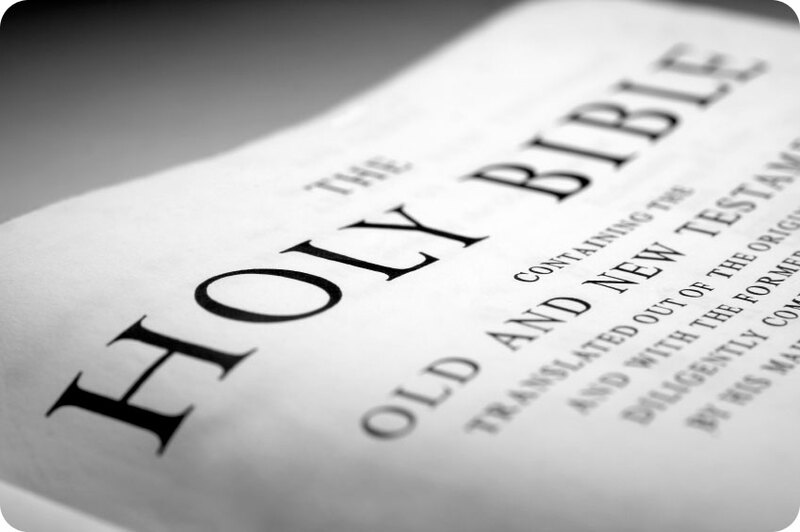 Such an erroneous argument is sometimes called the argument from ignorance or the god-of-the-gaps, and it is a very common mistake in reasoning. In the past, strange and unexplained phenomena were often explained in explicitly religious terms via the god-of-the-gaps. In humanity’s ignorance, lightning was attributed to the moods of powerful deities such as Thor or Zeus, and other seemingly “miraculous” events were said to be the work of angels, demons, or God. But now we know better… or do we? In modern times, what seems to have changed is not so much our reasoning, but the boogeymen we tap in an attempt to explain our ignorance. Rather than explain what we don’t know by making appeals to the blatantly supernatural (deities, angels, or leprechauns), more and more of us are using a new pseudo-religion of UFOology to explain the unknown as aliens in their ships with advanced technology. Perhaps when discussing UFOs, we should speak not of the god-of-the-gaps argument but “alien-of-the-gaps” instead. 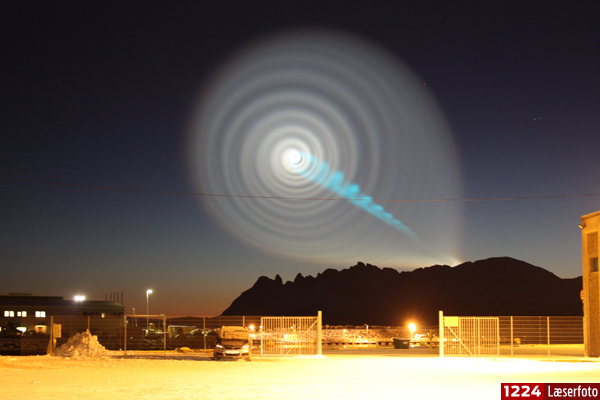 Therefore, in the end, all this Pentagon program illustrates is something that really shouldn’t be that surprising: sometimes fighter pilots see things in the sky that are of unknown origin. That’s it. For some reason, those three words are very unsettling to many, but the acknowledgement of what we do not know is often the first step to attaining new knowledge. The Denver UFO: Yup, It’s Unidentified… So What Does That Mean? Indeed, the news team does a so-so job of investigating this UFO, though there is a lot of sensationalizing in the report (surprise, surprise! ), but there is one point I would like to emphasize in greater detail which this report totally glossed over. That is the fact that this thing, whatever it is, is unidentified… as in Unidentified Flying Object. Repeat after me three times: unidentified flying object… Unidentified flying object… UNIDENTIFIED flying object!!! I want to be very clear on this point because, as I expected, the Internet is already abuzz with talk of alien spacecraft, government cover ups, and conspiracies galore. And those leaping to this dubious conclusion (that the thing is “obviously not of this world”) are committing what is known as an argument from ignorance – that is, in one breath they will admit that we don’t have enough information to conclude what it is, but then in the next breath they will say, quite emphatically, that it HAS to be an alien spacecraft. And such thinking contains a direct contradiction: the argument basically says that because we don’t know, then we know. With reasoning as loose as this, one can “justify” the existence of leprechauns, Flying Spaghetti Monsters, or Invisible Pink Unicorns! What the heck is wrong with saying “We don’t know” and just leaving it at that? … OK – everybody now… it’s bugs. This bug-UFO is especially bad because on some of the shots the insect actually hovers and moves around like an obvious insect. The videographer did not notice them because they were small fast-flying insects. Or perhaps they did notice the insects, but did not connect them to the unfocused black dots buzzing about on the video. It is also possible they know exactly what they are, but is just pranking the local news station (hence the anonymity). One or two shots in there are probably birds. You can see an apparent wing flap. 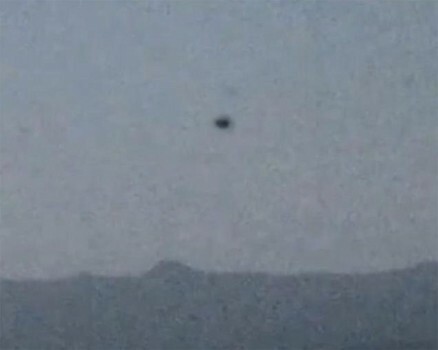 Birds and bugs are common sources of UFO artifacts in the video age. They are small objects close to the camera that will appear as out-of-focus dots and streaks that can be mistaken (by the willful or truly incurious) for objects that are large and farther away. The fact that no one saw them live and there was no radar tracking should be a clue, but for the believer can just add to the mystery. “Mysterious Planet-Sized Object” Is… A Planet! The mystery image of a “cloaked alien ship”… the Romulans, perhaps? Note the staggering level of argumentation from ignorance here. I like to call this sort of reasoning (if you can call it that) from various UFOologists the “alien-of-the-gaps”, because much like the related “god-of-the-gaps” argument from ignorance, what they do is find some kind of strange image and/or phenomenon for which they do not have en explanation and then they immediately give it an explanation unsupported by evidence. In short, because they don’t know what it is, they know it’s aliens! Huh?! This, of course, is a direct contradiction and points out just how ludicrous the general argument from ignorance can be. If the object is an Unidentified Flying Object (UFO), then by definition it is unidentified – which means that you admit right off the bat that you don’t know what it is! So if you don’t know what it is then how can you suddenly turn around and, seemingly without any kind of scientifically-valid or evidence-based reasoning, state that it is an alien spacecraft? Using such loose argumentation, I could just as easily claim the object in question is Santa Claus (but no, that would be silly). Of course, there’s another scientifically sanctioned explanation for the curious images, though we’re not certain that skeptics and UFO enthusiasts such as SiniXster will endorse it. Natalie Wolchover of Life’s Little Mysteries put the question to scientists in the solar physics branch at the United States Naval Research Laboratory (NRL). They’re the people who analyze data from the Heliospheric Imager-1 (HI-1)–better known in this context as the camera that shot the footage in question. To make the relatively faint glow of a coronal mass ejection stand out against the bright glare of space—caused by interplanetary dust and the stellar/galactic background—the NRL scientists must remove as much background light as possible. They explained that they determine what light is background light, and thus can be subtracted out, by calculating the average amount of light that entered each camera pixel on the day of the CME event and on the previous day. Light appearing in the pixels on both days is considered to be background light and is removed from the footage of the CME. The remaining light is then enhanced. So there you have it. 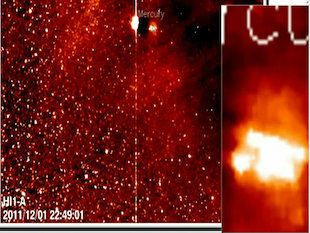 The object in question is basically an artifact that results from the combination of taking multiple images of that region in space over multiple days, the planet Mercury moving in that time, and processing the light in the image to enhance the coronal mass ejection to make it more visible. What stuns me about situations like these is just how quickly so many people are willing to invoke magical thinking and jump to conclusions (the “cloaked alien ship” explanation) in the absence of any real evidence. What is it about openly and honestly admitting that sometimes the most truthful answer is simply “we don’t know” that disturbs so many people? That, to me, is the real mystery. 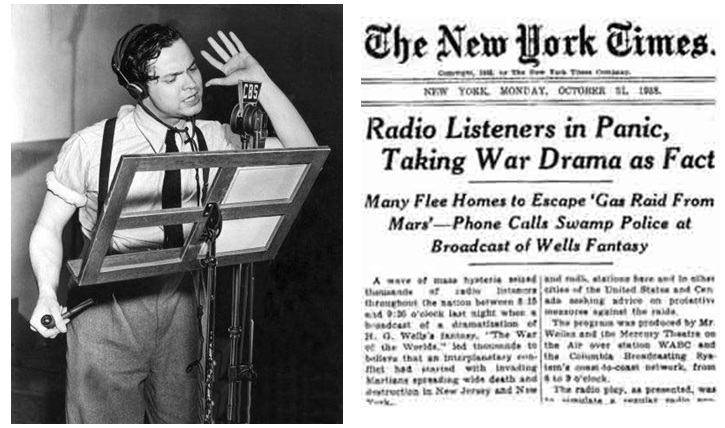 Every Halloween, when I’m not having fun at a party or handing out candy to trick-or-treaters, I like to take some time to listen to the 1938 radio broadcast of “War of the Worlds” by Orson Welles. 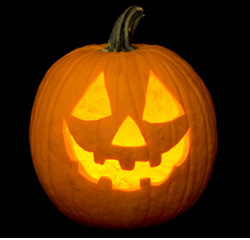 I do this for two reasons: 1) it’s a great story – full of suspense & the appropriate amount of spookiness for the season, and 2) it’s a wonderful lesson in skepticism. In fact, it is perhaps the first, best example of a widespread media hoax (however intentional or unintentional it may have been) with ensuing mass hysteria that we have in the United States, because so many people tuned in and took the story of the Martian invasion of Earth literally. Invaders from Mars? It was no wonder there was a panic! In a quickie post for all you UFO & alien buffs (whether you are a skeptic or believer), here’s a bit of news that is guaranteed to give the conspiracy theorists among you absolute fits. It seems that some former workers at Area 51 (yes, that “Area 51”) are now going public with the work they conducted there many decades ago. And none of it involved crashed alien spacecraft or bodies of ETs near Roswell, etc. After nearly five decades, guys like James Noce finally get to tell their stories about Area 51. The one that gets brought up when people talk about secret Air Force projects, crashed UFOs, alien bodies and, of course, conspiracies. The secrets, some of them, have been declassified. Noce, 72, and his fellow Area 51 veterans around the country now are free to talk about doing contract work for the CIA in the 1960s and ’70s at the arid, isolated Southern Nevada government testing site. Their stories shed some light on a site shrouded in mystery; classified projects still are going on there. It’s not a big leap from warding off the curious 40 or 50 years ago, to warding off the curious who now make the drive to Area 51. The veterans’ stories provide a glimpse of real-life government covert operations, with their everyday routines and moments of excitement. Noce didn’t seek out publicity. But when contacted, he was glad to tell what it was like. “I was sworn to secrecy for 47 years. I couldn’t talk about it,” he says. In the 1960s, Area 51 was the test site for the A-12 and its successor, the SR-71 Blackbird, a secret spy plane that broke records at documented speeds that still have been unmatched. The CIA says it reached Mach 3.29 (about 2,200 mph) at 90,000 feet. But after September 2007, when the CIA displayed an A-12 in front of its Langley, Va., headquarters as part of the agency’s 60th birthday, much of the secrecy of those days at Area 51 fell away. Advance warning to UFOlogists: Sorry, although Noce and other Area 51 vets say they saw plenty of secret stuff, none make claims about aliens. 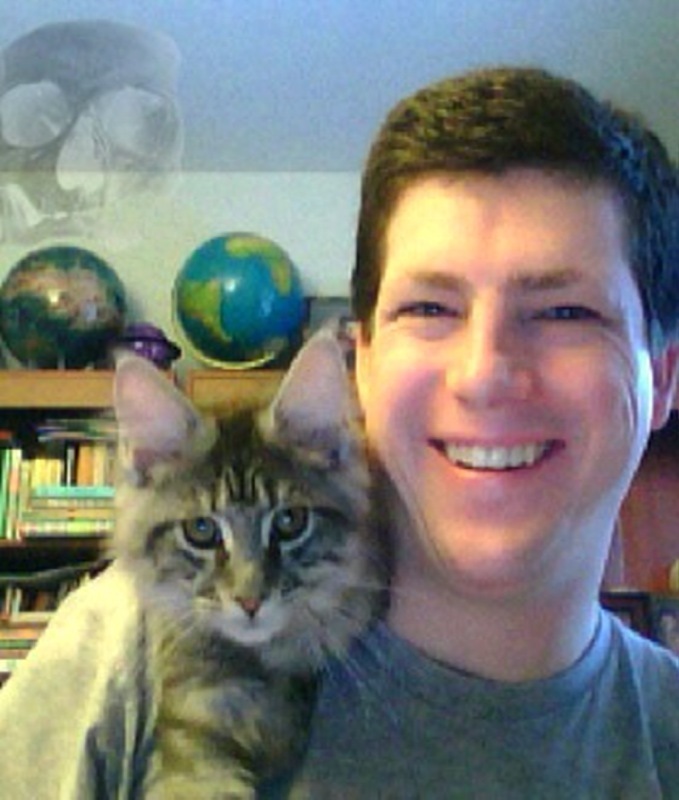 More iPhone/Touch Fun – Fake Your Own Ghost/UFO Photos! In keeping with the melding of modern technology with good ol’ fashioned skepticism, I’ve found out about a few neat iPhone/Touch apps that are, in my opinion, a must-have for any skeptic. These apps allow one to take photos and manipulate them into giving the appearance of having captured images of ghosts and/or UFOs & aliens. And while such photo manipulation is not proof positive that ghosts & aliens do not exist, when such manipulation is so easy to accomplish it should give one cause to pull out their Occam’s Razor in an effort to slice away the b.s. Recently we celebrated the 20th anniversary of a remarkable photograph that was taken by the Voyager 1 spacecraft as it began its long, slow exit from our solar system. 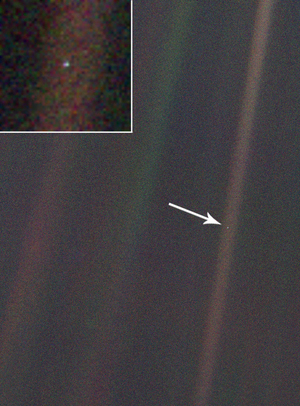 That photo was of the Earth, and the image was immortalized by astronomer Carl Sagan in his book called Pale Blue Dot. For a fuller story on this image, I suggest reading up on it all at this excellent NPR story. Failed Missile Launch a Russian Roswell Incident? Needless to say, this is a very interesting phenomenon, with some – to say the least – very interesting explanations being offered by various people for what it could have been. These, as the reporter in the video above, range from the relatively mundane (such as a failed Russian missile launch) to the usual nonsense from the woo-crowd (alien visitors) to the outright bizarre (a rogue black hole). So, in the absence of solid evidence, what is the most likely explanation? I posted earlier – in Texas Fireball Mystery – about how many people use the default explanation of aliens to explain UFOs (Unidentified Flying Objects), and this is often due to a tendency for people to argue from ignorance due to our lack of knowledge of the natural world. Well, according to new research, another naturalistic candidate to account for many UFO sightings has been discovered… high-energy electrical discharges called sprites. Researchers have detected the flashes between 35 and 80 miles (56-129 km) from the ground, far above the 7 to 10 miles (11-16 km) where usual lightning occurs. Sprites can take the form of fast-paced balls of electricity, although previous footage has suggested streaks or tendrils. The cause or function of the flashes remains murky, but Price suggested that they could explain some of the UFO reports which have cropped up over the years. That might provide some solace for UFO enthusiasts disappointed by human-caused hoaxes in the past. These are some pretty amazing discoveries concerning electricity & lightning in our atmosphere, and I think they are extremely cool! However, they aren’t alien. It is worth noting again that when confronted by something you see in the sky that is unknown to you (hence the Unidentified in UFO), it is best to simply state the obvious: you don’t know what it is. To jump immediately from the unknown straight to aliens visiting the Earth and government conspiracies to cover up The Truth is bad not only because it promotes a lack of critical thinking & healthy skepticism, but it can also lead us away from real discoveries, such as the most recent research on sprites.